Agilent Technologies Inc. (NYSE: A) has introduced the industry's first compliance test application for systems using double-data-rate 4 memory. The Agilent N6462A DDR4 test application helps memory design engineers accelerate turn-on and debug of DDR4 systems by automating the execution of physical layer tests, including the new data jitter measurements on Agilent Infiniium 9000, 90000A, 90000 X- and 90000 Q-Series oscilloscopes. DDR4 dynamic random-access memory technology with high-bandwidth interface operates at a maximum of 1.2 volts, 20 percent less than current DDR3 memory, and can achieve a data transfer rate of up to 3.2 giga transfers per second. The Agilent N6462A DDR4 compliance test application is designed for engineers who work on high-end computing applications. The application provides automated clock, electrical and timing tests. It automatically configures the oscilloscope for each test and generates an HTML report at the end of the test. The report compares the results with the specified test limit and indicates how closely the device passes or fails each test. 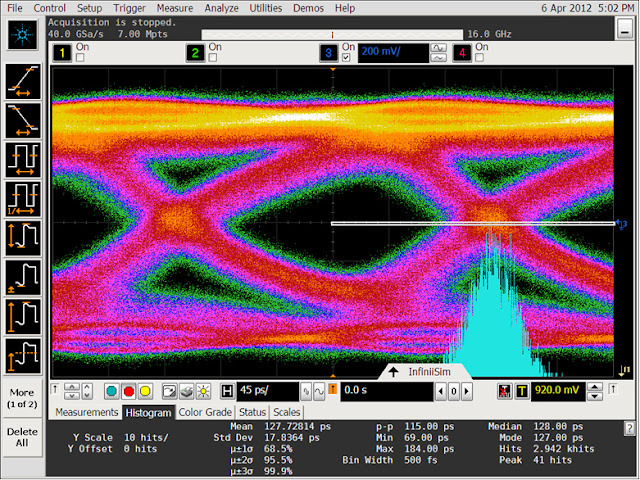 Engineers can easily debug signal integrity issues using the N6462A software in conjunction with the new InfiniiScan multichannel and multizone triggering features to successfully separate, read and write data. This unique InfiniiScan feature is available only with Agilent's 9000, 90000A, 90000 X and 90000 Q-Series oscilloscopes. "Our new DDR4 solution helps design engineers understand the effects of jitter on the data valid windows of their high-speed memory systems," said Jay Alexander, vice president and general manager of Agilent's Oscilloscope Products Division. "Using only four high-bandwidth oscilloscope channels with industry-leading noise and jitter performance, the Agilent Infiniium Q-Series high-performance oscilloscopes help customers make jitter measurements with confidence that they will achieve the maximum design margins in their DDR4 systems." Agilent Digital Test Standards Program experts are involved in various international standards committees, including the Joint Electronic Devices Engineering Council, PCI-SIG, Video Electronics Standards Association, Serial ATA International Organization, Serial Attached SCSI (T10), USB-Implementers Forum, MIPI Alliance, Ethernet standards (IEEE 802.3), Optical Internetworking Forum and many others. Agilent's involvement in these standards groups enables the company to bring the right solutions to market when customers need them. Agilent Technologies Inc. (NYSE: A) is the world's premier measurement company and a technology leader in chemical analysis, life sciences, diagnostics, electronics and communications. The company's 20,000 employees serve customers in more than 100 countries. Agilent had net revenues of $6.6 billion in fiscal 2011. Information about Agilent is available at www.agilent.com.